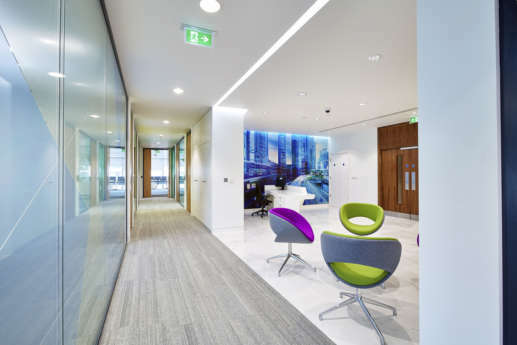 When global IT security experts, Thales, moved their IT services to a brand new office in Cambridge, they knew that their fit out would be safe with us. 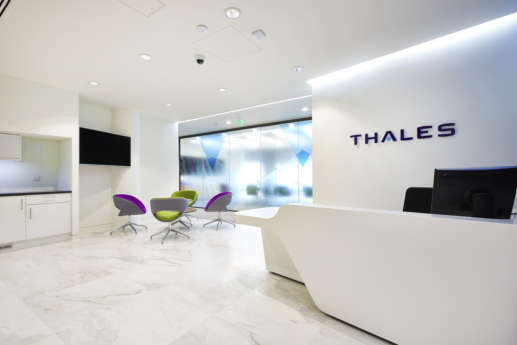 As world leaders in providing high-tech and secure solutions, Thales needed a workspace that would support their complex IT infrastructure and provide a stimulating environment for innovative thinking and collaboration. 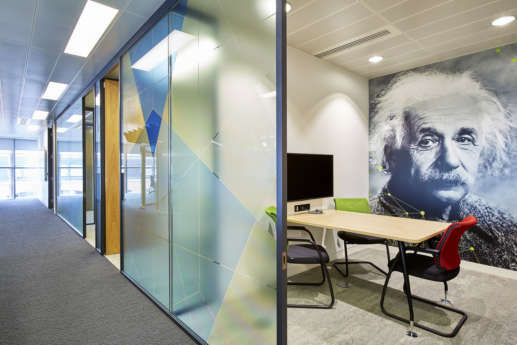 Thales’ new office is designed with collaboration in mind: traditional workstations in an open plan layout sit around the perimeter of the office with a vibrant Innovation Hub at its core. The colourful Hub features a dynamic mix of meeting spaces from private meeting pods, to open banquette seating, as well as huddle spaces and seating booths – there’s a space for every team and scenario. 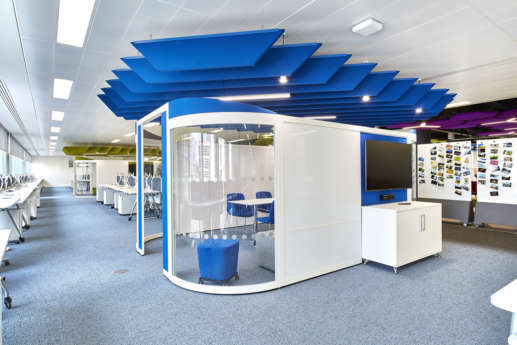 Each space is demarcated through colourful furnishings, with several areas accentuated with bright acoustic ceiling panels. 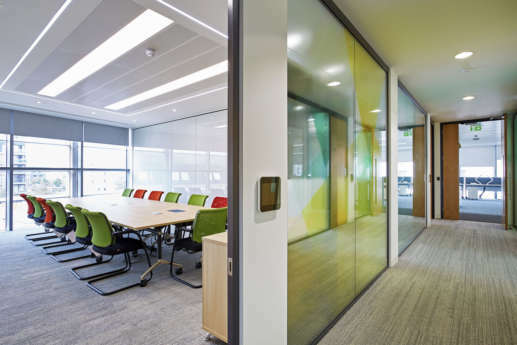 The private meeting pods have glass walls with colourful glass film manifestations to provide a level of privacy to the meeting spaces whilst adding to the colourful design of the office. 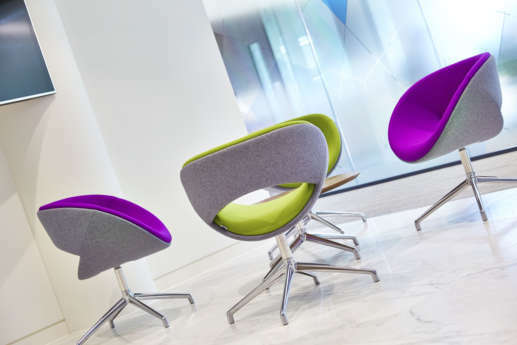 Likewise, the seating booths feature colourful artwork of scenes from around the world – a great way to promote creative thinking and recognise the company’s internationalism. 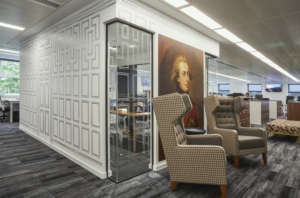 In the meeting rooms, floor-to-ceiling prints of some great minds from history adorn the walls, inspiring everyone. The unique characteristics of the design are seen again in the choice of furnishings. 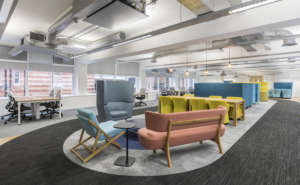 Different colours and patterns are featured, with a cluster of deckchairs available for a more fun and relaxed meeting setting. 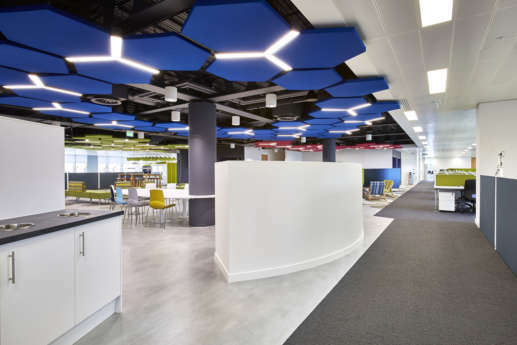 Due to the open plan layout of the office, acoustic surfaces were used throughout to help decrease sound travel and reduce distractions for those using the area and surrounding traditional work areas. The flexible meeting area at the front of the office can also be converted into a ‘Townhall’ space to support company-wide meetings. 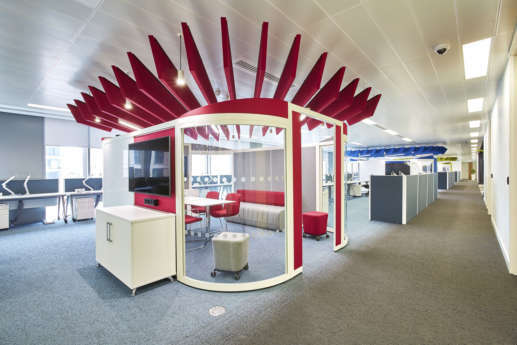 The Innovation Hub has been ideally situated to boost collaboration: with desks around the perimeter of the office, colleagues have to walk through the Hub to reach the other side of the office. This increases the chance of serendipitous encounters between colleagues, which will boost opportunities for collaboration. When that does happen, colleagues have the perfect touch-down points to continue their discussions. Flat screen displays are used throughout to allow collaborating colleagues to share work with each other, and to work seamlessly wherever they are in the office. 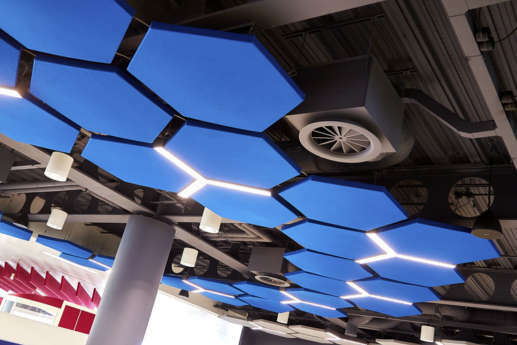 One of the most striking elements of this design are the hexagonal acoustic ceiling panels at the centre of the Innovation Hub. 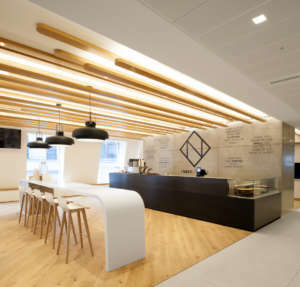 Whilst looking effortlessly cool, these complex structures required a high level of attention to fit, taking into account the exposed surfaces above, and the need for light fittings between some of the gaps. 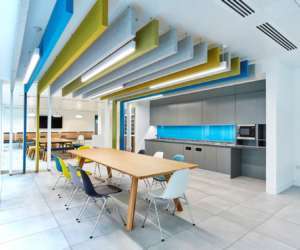 The result is a bright, vibrant focal point, that not only looks great – but also reduces noise distractions of the open plan office. 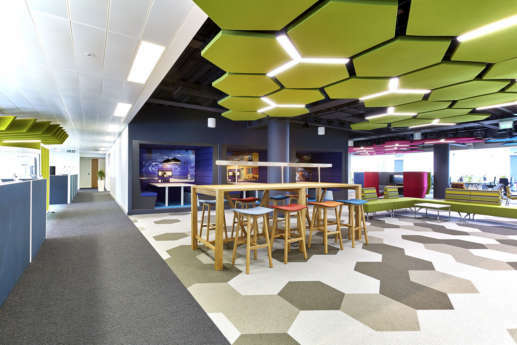 The hexagonal shapes are further enhanced through a similarly patterned carpet which mirrors the ceiling above. 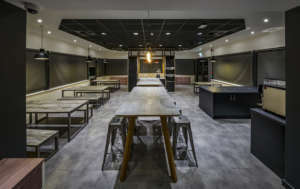 A complex Comms room was an essential component which needed to be completed four weeks before the rest of the build. 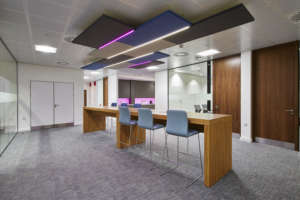 As the home for high-powered servers, generating a large amount of heat and noise, we needed to build a room that would provide enough ventilation and sound proofing to reduce its impact on the rest of the office. 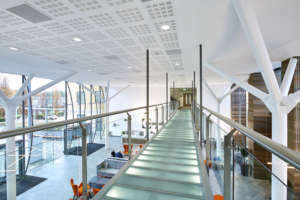 We therefore raised the floor 600mm to provide extra air-conditioning and fitted Denco units to keep things cool. 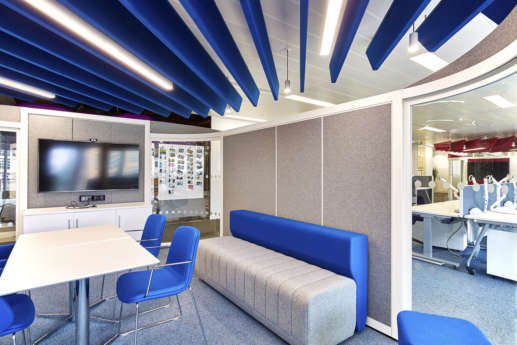 Sound acoustic attenuators were also installed to ensure noise didn’t impact the IT build team next door.